I have successfully trained my adopted rescue dog to accept being left in a crate and was careful to buy a crate big enough for her to stand up and stretch out. I put in a couple of Kongs filled with her breakfast. These are great and keep her occupied for a while but the problem is they take up space on the floor and I come back to find her lying in the corner of her large crate as she doesn’t have the sense to push the two feeding toys out of the way so she can stretch out. She has to stay in the crate for quite long periods maybe 4-5 hours at times and I worry about her not stretching etc. 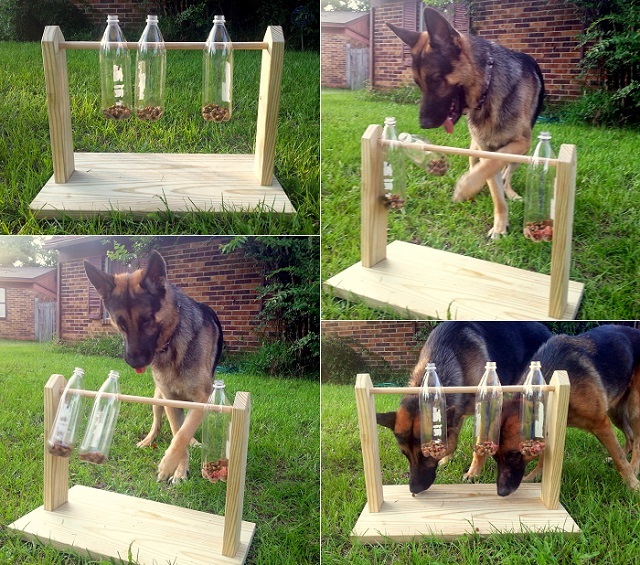 So my question is: does anyone know of any ‘wall mounted’ or hanging treat dispensers/activity station type products? I know you can get hanging enrichment ‘toys’ for pigs and horses, but something smaller for dogs?? This would solve 2 problems – 1) the available bed/floor space in the crate and 2)the need to stretch out. Kong make a toy for parrots which is essential a kong with a hook attached through the small end so it can be hooked onto the cage and sits horizontally. That may be good for a small dog?? Or maybe try and coconut shell or similar with holes drilled in and hung from the top of the crate. Have treats hidden inside that will fall through the holes if its shaken around. You could easily make something like this to go in the crate using the bars of the crate to support the pole on rather than needing to make a stand for it.